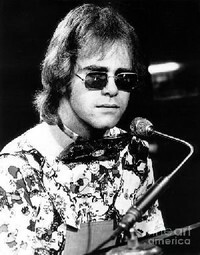 Elton John is an English pop singer , composer and pianist . After a career of 35 years there were more than 250 million recordings sold him , making it one of the most successful artists of all time . The 1997 remake of his single Candle in the Wind ( original from 1973) , which was created following the death of Princess Diana , more than 37 million copies were sold. Of his 56 singles landed there in the American Top 40 , 16 in the top 10 , four in the second and nine in the first . He has six Grammy Awards, an Academy Award , a Golden Globe and a Tony Award. His success had a profound impact on popular music and made sure the piano remained popular in the rock 'n' roll . In 2004 he took the 49th place in the list of greatest artists of all time by Rolling Stone . In 1994, Elton John was inducted into the Rock and Roll Hall of Fame . Since the end of the eighties he makes a large contribution to the fight against AIDS . He is a strong supporter of the LGBT movement too. In 1998, Elton John was appointed a Knight Bachelor . In 2008, Billboard magazine placed him in third place on the Billboard Hot 100 50th Anniversary Charts , which Elton John , according to this list was the most successful male solo artist ever.